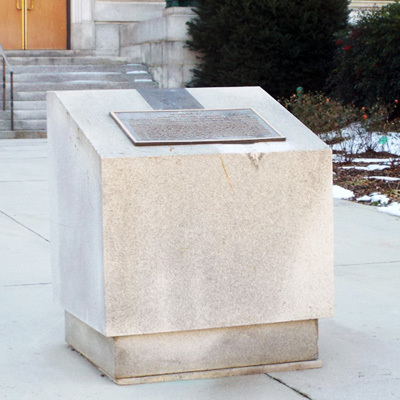 The Edwin Bain memorial is a large lectern shaped block of granite several feet tall with a bronze tablet attached. The unadorned tablet gives details on Bain’s participation in the famous 1942 “Doolittle Raid” on Japan; the first United States offensive action against the Japanese mainland in World War Two. Above the bronze tablet is a brass plaque depicting the military patch of the “Doolittle Raiders.” Prominent on the patch is the Raider Crest representing the plane crews that participated in the raid. The crest has seven Maltese Crosses which come from the standard of the 17th Bomber Group, from which three of the squadrons were selected – the 34th Squadron, represented by a Thunderbird; the 95th Squadron, represented by a Kicking Mule; and the 37th Squadron, represented by a Tiger’s Head. The winged Helmet represents the 89th Reconnaissance Squadron. Above the crest is a Mitchell B-25 Bomber and beneath is the motto “Toujours Au Danger” (Ever into peril). ON APRIL 18, 1942, 16 LAND-BASED ARMY B-25 MITCHELL BOMBERS LED BY LT. COL. / JAMES H. “JIMMY” DOOLITTLE TOOK OFF FROM THE NAVY AIRCRAFT CARRIER USS HORNET / TO ATTACH JAPAN. THIS HISTORIC MISSION WAS THE FIRST OFFENSIVE ACTION OF WORLD / WAR II AGAINST THE JAPANESE MAINLAND. THE 80 CREW MEMBERS WERE ALL / VOLUNTEERS. M/SGT. BAIN WAS A GUNNER ON CREW NO. 14 WHICH BOMBED AN / AIRCRAFT PLANT IN NAGOYA. AFTER FLYING 13 HOURS AND 2,000 MILES, BAIN AND HIS / CREW BAILED OUT OVER CHINA. HE LATER SERVED IN NORTH AFRICA WITH THE 320TH / BOMB GROUP AND WAS KILLED ON A COMBAT MISSION NEAR ROME, ITALY WHEN HIS / B-26 CRASHED AT SEA. HE IS TYPICAL OF THE MANY DEDICATED AMERICANS WHO / HAVE RISKED AND SACRIFICED THEIR LIVES FOR THIS GREAT NATION. MAY GOD BLESS / THOSE WHO ARE GONE AND THOSE WHO REMAIN. The story of Edwin “Red” Bain’s inclusion with one of the raider flight crews was covered in newspapers across the United States. Just prior to the mission the tail-gunner on one of the planes was hospitalized. Lt. Colonel Doolittle needing a replacement noticed Bain working on a radio, tapped him on the shoulder and asked if he knew anything about a tail gun. “No sir,” Bain replied, "I'm a radioman." "That’s what you were,” said Doolittle. “You’re a tail-gunner now. Get ready to leave with us at once.” Bain learned gunnery during the sea voyage prior to his plane launching from the USS Hornet. 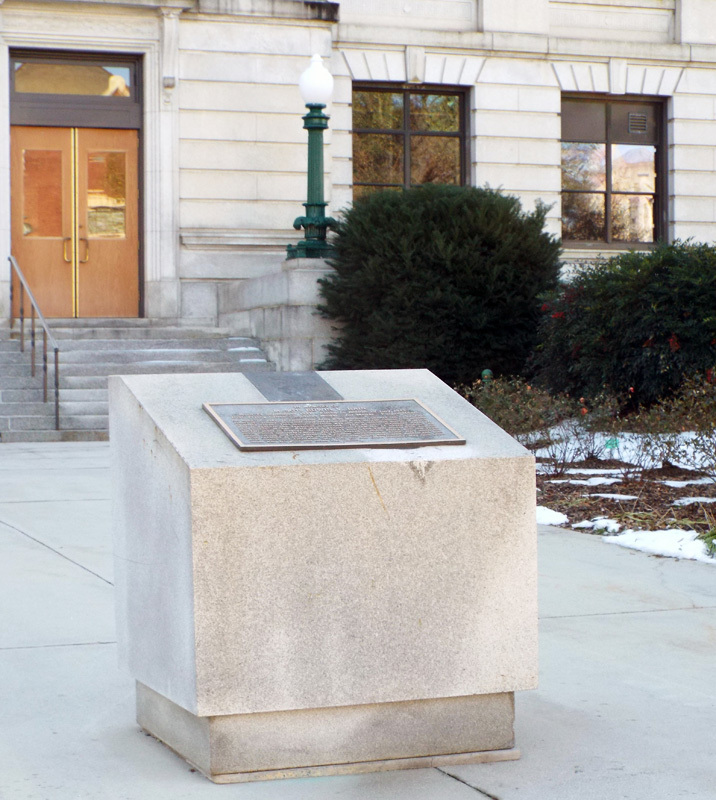 The Bain memorial is located in front of the Old Guilford County Courthouse on the 200 block of W. Market St., in Greensboro, NC. It stands near the street, in the middle of the sidewalk, leading to the building’s front entrance. A short distance to the west, are memorials dedicated to Pfc. Phill G. McDonald, Guilford County Vietnam Dead, Iraq and Afghanistan War Dead, and Greensboro Millennium Gate. The memorial marker stands in the middle of a walkway leading to the main entrance. Bushes and seasonal greenery adorn the walkway.